Home > Uncategorized > Fisher-Price Laugh & Learn Servin’ Up Fun Food Truck Only $45.99 + Free Shipping From Amazon! 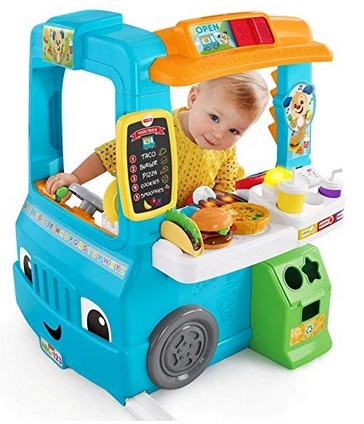 Fisher-Price Laugh & Learn Servin’ Up Fun Food Truck Only $45.99 + Free Shipping From Amazon! April 15, 2019 Comments Off on Fisher-Price Laugh & Learn Servin’ Up Fun Food Truck Only $45.99 + Free Shipping From Amazon! Amazon has the Fisher-Price Laugh & Learn Servin’ Up Fun Food Truck for 55.99, plus clip the $10 coupon that’s on the product page to bring the price down to only $45.99 + Free shipping! “Magical” cash register reads all 4 menu cards! “Ring up” orders by pressing the number buttons, and push the music button for a playlist of learning songs and more! Today Only – Save On Ecovacs Robot Vacuums From Amazon! Skip Hop Zoo Little Kid Backpacks Only $10 – $14 + Free Shipping! !